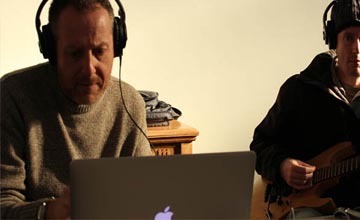 Accredited Interactive Music and Drama course’s for Adults in Flintshire and Wrexham. It’s a great opportunity to make new friends, write your own plays and learn to play instruments. 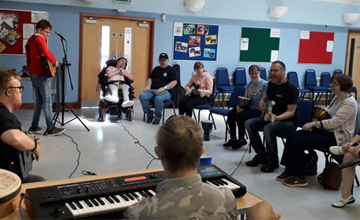 We work in peoples homes providing 1-1 music workshops, including working with people who are unable to access the community due to illness. 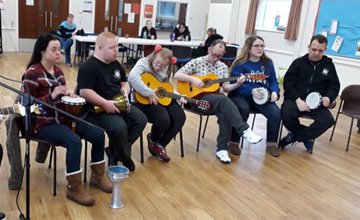 Emerge Community Arts work with Addysg Oedolion Cymru/Adult Learning Wales to deliver accredited Interactive Music and Drama course’s for Adults in Flintshire and Wrexham. Are you looking for music, creative and performing arts workshops for your school, or community centre or day service provision? Get in touch today. 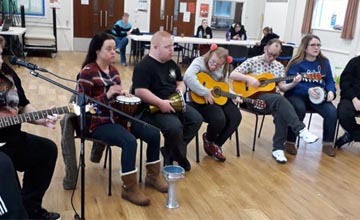 Emerge Community Arts delivers interactive music, drama and meditation workshops to children, young people and adults in the community. 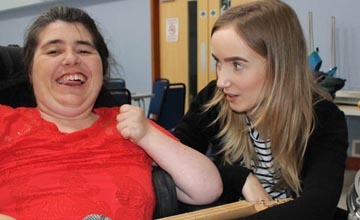 The workshops are a great way to develop your sense of well-being, self confidence and communication skills. We work in a wide variety of settings and deliver courses across North Wales & the North of England. If you are interested in finding out more please get in touch.